As long as information was just data files and systems just computers, the respective roles of enterprise and IT architectures could be overlooked; but that has become a hazardous neglect with distributed systems pervading every corner of enterprises, monitoring every motion, and sending axons and dendrites all around to colonize environments. Yet, the overlapping of enterprise and systems footprints doesn’t mean they should be merged, as a matter of fact, that’s the opposite. When the divide between business and technology concerns was clearly set, casual governance was of no consequence; now that turfs are more and more entwined, dedicated policies are required lest decisions be blurred and entropy escalates as a consequence. The need of better focus is best illustrated by the sundry meanings given to “system”, from computers running software to enterprises running businesses, and even school of thought. As far as enterprises are concerned, systems combine human beings, devices, and software components. Users are supposed to be actual agents granted with organizational status and responsibilities, and possessing symbolic communication capabilities. Software components and actual devices cannot be granted with organizational status or responsibilities; the former come with symbolic communication capabilities, the latter without. Assuming that interactions are governed by information, the objective is to understand the contribution of each type of component with regard to information processing and decision-making. The business value of applications is assessed locally instead of being driven by enterprise objectives and organizational constructs. System models are confused with the programs used to produce software components. Requirements life cycle, governed by the time-span of business contexts and objectives, is confused with the cycles of reuse of architecture assets. Since engineering agenda are supposed to support business objectives, their decision-making processes must be aligned yet managed independently. That reasoning also applies to services management whose role is to adjust resources and software releases to operational needs. Enterprise architectures can then be described as a cross between architecture assets (business objects, organization, technical architecture) on one hand, core processes for business, engineering and services management on the other hand. Information is to provide the glue between architecture assets and supported processes. As understood by Cybernetics (see Stafford Beer, “Diagnosing the System for Organizations“), enterprises are viable systems whose success depends on their capacity to countermand entropy, i.e the progressive downgrading of the information used to govern interactions between systems and their environment. And that put knowledge management at the core of systems capabilities. At enterprise level facts pertaining to the conduct of business are captured from environments before being organized into information meant to support enterprise governance. System level deals with symbolic descriptions of functionalities (information). At this level data is irrelevant, the objective being the consolidation and reuse of shared representations and patterns (knowledge). The technical level is in charge of operational governance: software components, platforms capabilities, technical resources, communication mechanisms, etc. On one hand contexts are to be monitored and data translated into information; one the other hand operational decisions have to be made (knowledge) and executed which means information translated into data. If architecture levels can be characterized by processing capabilities, their engineering must be aligned to the corresponding objectives and time frames. Phased projects (P) give precedence to software development, with requirements supposed to be set at inception and acceptance performed at completion. Agile projects (A) give precedence to business requirements, with development iterations combining specifications, programming, and acceptance. Agile development models are driven by users’ value and based on the implicit assumption that business and technology concerns can be dealt with continuously and simultaneously. That may be difficult when external dependencies cannot be avoided and shared ownership cannot be guaranteed. Phased development models take a mirror position by assuming that business concerns can be settled upfront, which is clearly a very hazardous policy. Those pitfalls may be overcome if engineering processes take into account the distinction between knowledge management on one hand, software development on the other hand. Knowledge management (KM) encompasses all information pertaining to the conduct of business: environment, markets, objectives, organization, and projects. With regard to engineering projects, its role is to define and consolidate the descriptions of symbolic representations to be supported by information systems. Software development (SD) starts with symbolic descriptions and proceeds with the definition, building and acceptance of the corresponding software artifacts. Service management (SM) provides the bridge between engineering and operational processes. Capture of information from data and legacy code can also be achieved respectively by data mining and reverse engineering. Depending on organizational or technical dependencies, knowledge management and software development will be carried out within integrated development cycles (agile processes), or will have to be phased in order to consolidate the different concerns. That engineering distinction neatly coincides with the functional divide of architectures: knowledge management supporting enterprise architecture, software development supporting system architecture. Business processes are governed by collective representations mixing goals, models and rules, not necessarily formally defined, and subject to change with opportunities. Engineering processes for their part have to be materialized through work units, models, and products, all of them explicitly defined, with limited room for change, and set along constraining schedules. Given that systems’ fate hangs on the hing between business and engineering concerns, the corresponding perspectives must be properly aligned. Knowledge management takes charge of symbolic descriptions pertaining to enterprise concerns. Its objective is to map business and operational requirements with the functionalities of supporting systems. Expressed in MDA parlance, the former would be described by computation independent models (CIMs), the latter by platform independent models (PIMs). Software development deals with software artifacts. That encompasses the consolidation of symbolic descriptions into functional architectures, the design of software components according to platforms specificity (PSMs), and the production of code according to deployment targets (DPMs). IT Service Management is the counterpart of knowledge management for actual operations and resources. Its objective is to synchronize business and development time-frames and align operational requirements with releases and resources. That congruence between architecture divides (enterprise, systems, technology), models layers (CIMs, PIMs, PSMs, DPMs), and engineering concerns (facts or legacy, information, knowledge), provides a reasoned and comprehensive framework for enterprise architectures. Architectures describe stocks of shared assets, processes describe flows of changes. Given a hierarchized description of architectures, the objective is to ensure the traceability of concerns and decisions across levels and processes. Deontic dependencies are set by external factors, e.g regulatory context, communication technologies, or legacy systems. Alethic (aka modal) dependencies are set by internal policies, based on the assessment of options regarding objectives as well as solutions. Architecture Capabilities and Processes, with deontic (basic) and alethic (dashed) dependencies. This distinction between dependencies is critical for decision-making and consequently for enterprise governance. Set within time-frames and decorated with time related features, those dependencies can then be consolidated into differentiated strategies for business, engineering and operational processes. Assets: shared decisions affecting different business processes (organization), applications (services), or platforms (purchased software packages). Agile approaches should be the option of choice for requirements neatly anchored to users’ value. Phased approaches should be preferred for projects targeting shared assets across architecture levels. When shared assets are within the same level epic-like variants of agile may also be considered. While there is some consensus about the scope and concerns of Enterprise Architecture as a discipline, some debate remains about the relationship between enterprise and IT governance. Beyond turf quarrels, arguments are essentially rooted in the distinction between information and supporting systems or, more generally, between organization and IT. Actual scope deals with current or planned business objects, assets, and processes. Symbolic scope deals with the design of the corresponding software components. That distinction matches the divide between enterprise and systems architectures: one set of models deals with enterprise objectives, assets, and organization, the other one deals with system components. Business processes are clearly designed at enterprise level, both for their organization and the symbolic description of system representations. Software engineering ones are under the responsibility of IT governance, from system and software architecture to release and deployment. Actual architectures encompass business organization (locations, agents, devices) and systems deployments. 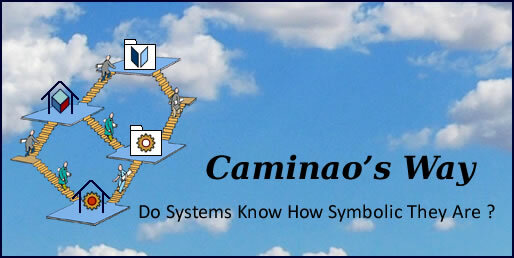 Symbolic architectures include systems functionalities and software development. Processes carry out Architectures alignment (Pb,Pe), Architectures support Processes consistency (As, Ap). Symbolic architectures provide the mediation between business requirements and software development (As). Physical architectures do the same between software development and services management (Ap). Business processes take responsibility for the mapping of enterprise architecture into symbolic representations (Pb). Engineering processes do the same for the alignment of software and deployment architectures (Pe). Enterprise and IT governance can then be defined in terms of Knowledge management, with engineering and business processes gathering data from their respective realms, sharing the information through architectures, and putting it to use according their respective concerns.